I started this web site in the Summer of 2007. It was just after I came to live in the Sierra de Montánchez and realised there were unexplored walking opportunities available in the area. I wanted to share what I was discovering, firstly with family and friends and later, with the much wider, and international, walking community. Walking Extremadura will show you the beauty of walking in this area - and not just walking. This is also the place for painters, flower lovers, bird watchers, photographers, animal lovers and people who love history. That’s before we start on about lovers of good food and relaxed and enjoyable company. You will find all that and more in Extremadura. To navigate this site use the horizontal menu bar at the top. All the walks can be found listed under the 'walks' button, then the area in which they are located geographically. It's logical, I hope. The site has been made simple so that all of us spend less time on the computer and more time walking. I have my boots on, ready, as I write. My second book, in English, on walking in Extremadura, features some of the best sierras in which to walk. The routes are grouped to make holiday planning easier and to cut out the need to travel by car to reach the start of a walk. I hope you enjoy the walks. Today just four of us walked the pretty 'Walk of the Peonies' in the sierra near the village of Robledillo. The flowers, flowering bushes, bluebells and, of course the peonies, were beautiful. 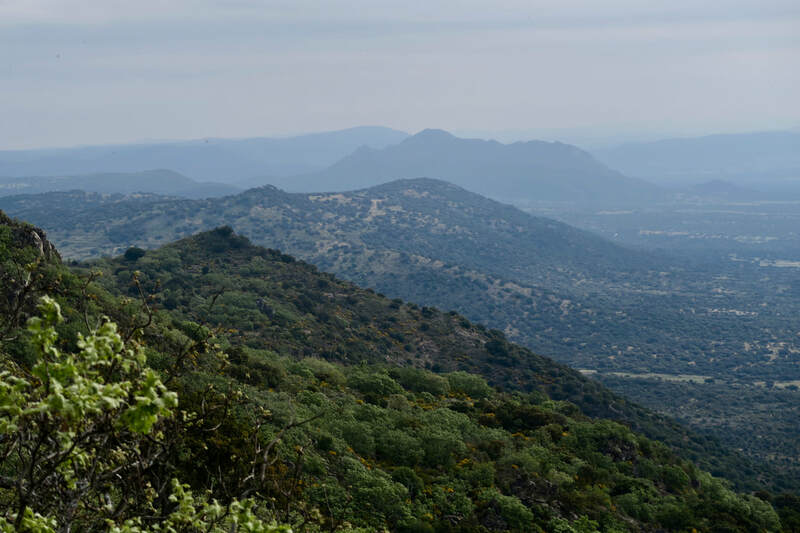 The photo, above, is the view north towards the Sierra de Santa Cruz, taken from the high point of the route we walked. Three weeks ago I spent three days in the company of Sophie Wright from Martin Randall Travel. The company is looking for walking opportunities in the area for future holidays. Sophie and I did five walks and covered 45km in that time. The countryside was fabulous and we had exceptional Spring sunshine. One of the walks we enjoyed is posted here. ​• The week before, I walked a route I had not done for a year or two just south of the village of Alcuéscar. This has given me the chance to update the information on the walk, here. • In early February I walked in the woods between Hoyos and Trevejo on the SL CC-211 as an out-and-back walk of 13km. The woods were alive with bird song and it was a perfect day, sunny and even quite warm. I've posted the walk, here. • The walk from eight weeks ago is on the web site here. We are not on FaceBook or Twitter (I'd rather be walking) but if you want to keep up with the news just put us into 'favourites' and visit every so often.